Yesterday, the eleventh annual Citizen of the Year awards for the three Bridgewaters were awarded by the Rotary Club of the Bridgewaters at a dessert reception at Bridgewater State University. The awards are given to individuals "who have made an outstanding contribution to the quality of life in the respective community." A selection committee of five Rotary members reviewed nominations and made its recommendations to the club for approval. This years recipients are Alicia Boucher of East Bridgewater, Bruce Holmquist of West Bridgewater, and historian Bob Wood of Bridgewater. Jo-Ann Coles presented the testimonial for Mrs. Boucher; Richard Warmington did the same for Mr. Holmqust; and David Moore was the presenter for Mr. Wood. Also, West Bridgewater Selectwoman Nancy Maloney read a proclamation from the Board of Selectmen for Bruce Holmquist. The Grand Sponsor for the event was Bridgewater Savings Bank. Its President and CEO, James Lively,welcomed those present and emphasized the important of community leaders giving back to their communities and their residents. The Community Bank sponsored the Bridgewater recipient and Salon Esprit was the sponsor for the East Bridgewater Citizen of the Year. Kevin Inkley, president of the Rotary Club of the Bridgewaters, served as the master of ceremonies. Bridgewater: the late James "Ken' Moore; Geoffrey A. Domenico; Dr. Adrian Tinsley; Robert J. Stearns; Thomas Arrighi; Brian Tatro; the late Matthew Striggles; William Callahan; Katherine M. Doherty; and Betty Gilson. East Bridgewater: Dr. Judith Riordan; Robert E. McCarthy; Margaret Alexander; Peter P. Spagone; Beth Hayes; Joseph M. Smith; Kris Resendes; Julie Whitmore; the late Jane Haines; and Charles Muise. West Bridgewater: David Meade, Jr.; Robert L. Smith; Edmund Stewart; Eldon F. Moreira; Frank & Pearl Nelson; Joyce Francis; Steve Barrett; Jerry Lawrence; Marilyn Raleigh; and Matthew Albanese. Alicia Boucher was born in Poland to Jan and C. Jessie (Kozlowska) Andruk. When she was 6 years old the family moved to the United States before the onset of World War II, originally living in a “Polish community” in Cambridge, Massachusetts. Mrs. Boucher has four brothers - George, Edwin, Bohdan and Tadeusz and a sister – Krystyna Leroe. The family moved to a small farm in the Scotland area of Bridgewater. She attended junior and senior high school in Bridgewater and with the encouragement of an eighth grade teacher, Alicia Boucher decided to pursue a career as a teacher, graduating from Bridgewater State College (now University). Interwoven with the raising of her family Alicia taught primarily 6th grade for 30 years in the Brockton Public School system, enjoying classes as large as 45 and as few as 25. She is still involved as the Parliamentarian of the Retired Educators of Plymouth County. Alicia Boucher is and has been a significant community volunteer, including 16 years as a member of the Kiwanis Club of East Bridgewater; Treasurer of the Catholic Women’s Club of St. John’s parish; a charter member of the Friends of the East Bridgewater Public Library and a trustee for 20+ years; Sachem Nursing facility in East Bridgewater; and the Arbors Nursing Facility in Taunton. In addition, Alicia is a long-time member of the Ousamquin Women’s Club of Bridgewater and has been a committed volunteer at Kiwanis’ Pediatric Trauma Center at Tufts New England Medical Center in Boston. Bruce Holmquist was born in Brockton, Massachusetts as the only child of Florence (Burrill) and Robert Holmquist. When he was quite young, his parents built a home in West Bridgewater and Bruce remained here as a proud resident, and has served the community in many capacities. Bruce attended West Bridgewater High School and loved sports, especially football. He earned a full college scholarship with his football skills, but his father passed away during the final week of his senior year in high school and he made a promise to his dad to care for his mother and two grandmothers. True to his word, he gave up his scholarship and remained in West Bridgewater caring for his mother and grandmothers, Myrtle Holmquist and Martha Perkins. Bruce went on to play semi-pro football for many years. Although he had no children, he has nieces and Goddaughters who are very special to him; namely Kara (Humphreys) Jennings, Christine (Ginn) Cronin, Jennifer Ginn, and Renee Matthews. He looks forward to spending time with them and their families in his retirement. Bruce’s fiancée, Pamela Humfryes, assisted with this biographical statement about him. Mr. Holmquist joined the hometown fire department in 1966 until an opening became available on the police department the next year. At that time, the police served as first responders to all emergencies, including the birth of several children and he received a letter of commendation from the Selectmen for providing emergency medical care and saving a life. Bruce continued his education with Massasoit Community College and graduated from the Massachusetts Police Academy. He continued to take police-related courses to keep up to date, including the Truck Enforcement team, the Attorney General’s Seminar course on drug abuse. , and was certified for the LEAPS system of the Registry of Motor Vehicles. During his tenure as a police officer, he initiated programs for the protection of the community, including first Safe House programs and Bruce was he first bicycle patrolman on the force, working with the schools on bicycle safety programs. Mr. Holmquist’s professional and volunteer contributions to the community are too numerous to list is this space, however it is important to note that caring for his grandmothers gave him a protective sense for elderly citizens. He became a member of the Council on Aging and volunteered for a number of programs, including back up driver for meals-on-wheels, serving lunches, assisting with their annual health program and providing elderly counseling. One of Bruce’s favorite volunteer positions is as assistant coach to the West Bridgewater high school football team. The first year he volunteered, there were only 17 young men on the team and they went all the way to the championship. He finds working with youth rewarding. Bruce Holmquist retired from the police department in July 2010 and received citations from the Massachusetts Senate and the Massachusetts House of Representatives in appreciation of his 44 years of service. He also received a citation from the West Bridgewater Selectmen for his 44 years of community service and named August 4th as “Bruce Holmquist Day”. Robert (Bob) Wood was born in Methuen, Massachusetts to parents, Catherine and Dr. J. LeRoy Wood. During World War II his father was stationed in Hampton Roads Port of Embarkation, Hampton, Virginia and the family, Bob and his two sisters, lived there. After returning to the Bay State, Bob went to Methuen schools and then to Tilton School in Tilton, New Hampshire. Bob became interested in history and airplanes and after graduating from Tilton entered Norwich University in Northfield, Vermont, a military college. After graduation he was in the Army at Ft. Knox, Kentucky and after serving 6 months active duty, attended the Army Reserves for many years, finishing his service as a Captain. He later worked in New York City for American Airlines and then back to Lawrence at Sutton Travel. He had communication with a former Norwich professor who had become Director of the Air Museum at the Smithsonian in Washington, D.C. He was offered a position in the museum library. There were only a few employees at that time. He moved to DC in 1959. Bob married a college friend of his sister, Ann Douglass of Bridgewater. They lived in Bethesda, Maryland for 24 years with their two children Bill and Nancy. The air museum grew to be the National Air and Space Museum. Bob had charge of the boxes of history in several locations that the museum managed. He left there in 1984, moved to Bridgewater, and started working at the National Archives in Waltham, MA, managing records acquisitions. He retired in 1999. Bob served on the Town of Bridgewater Planning Board for ten years and become interested in local history and deeds of old properties. He is a member of the Historical Society in Bridgewater, the 2020 planning committee, the Old Bridgewater Historical Society and the Joint Transportation Commission. He has now researched the deeds and has drawn drawings for most of the area in the center of Bridgewater, Mt. Prospect Cemetery, Legion Field, the prison and the University. His deed research has resulted in a lot of interesting pieces of land, the great Cedar Swamp, the Common and Academy building. They all have their own stories. History is being preserved. “I like to read the deed, draw it out and hope the points all match especially with neighboring plots. It keeps me busy and the mind active. I have a varied collection” said Bob Wood. The Bridgewater Garden Club is hosting its semi-annual HOUSE TOUR/GREENS SALE/COOKIE WALK Saturday, Dec 4th at 9:00am until 3:00pm. Five beautiful houses around Bridgewater will be decorated using fresh greens by BGC members. Also available to purchase will be embellished wreaths, swags, baskets, cups, bows, bags of greens and cookies all made by BGC members. This event will take place at starting at 9:00 AM at The Senior Center, 10 Wally Krueger Way. This is a fundraiser event and the proceeds will benefit towards scholarships. For ticket information please call 508-697-7617. Christmas on the Common is Sunday, December 5th from 1 to 4PM. 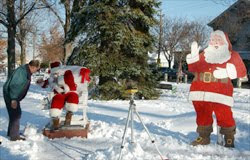 This annual holiday event is held on the Bridgewater Common in the center of town. Bring the family to meet Santa, get your picture taken, listen to the music of Oldies 103.3 and the Trinity Covenant Church and enjoy, pony rides, hot chocolate, a Christmas Bazaar and more! Decorations on the Common are provided by the Bridgewater Lions Club. For additional information about Christmas on the Common and to see the local businesses that support this great event, check out the website by clicking here. Bridgewater Academy Lions Club 18th annual TV auction will be held on Sunday, December 5th from 5 p.m. to 10 p.m. The auction will be televised live from BTV9. Bidders can bid by phone from the comfort of their own homes while watching the items and listening to the descriptions on TV. The donated items include gift certification for restaurants, airport transportation, beauty shops, and local retail stores. Also available will be improvement and decorator items, food and gift baskets, hand-crafted items, collectibles, and more. All of the proceeds will benefit the Massachusetts Lions Eye Research Fund, which makes funds available to local medical research facilities in order to treat and/or cure preventable blindness. For further information, or to donate an item, call 508-577-6931. If you love to sing then you're just the person St. Thomas Aquinas is looking for! They are in the process of establishing a choir that will sing at the 10AM Mass on Sundays. Rehearsals will be on Tuesday evenings from 7 to 9PM. Anyone 12 years old and up is welcome to join. If you are interested in joining, please contact Nancy Steenbruggen at 339-469-1786 or email her at nsteenbruggen@gmail.com. An educational presentation for parents of all students on bullying and cyberbullying will be presented by the Massachusetts Aggression Reduction Center (Bridgewater State University) tomorrow evening, November 30th, at 7:00 PM. The lecture will take place at the Bridgewater-Raynham Regional High School Auditorium. Come learn about recent research on how bullying happens and how parents can partner with schools to prepare and protect their own children. This presentation will also focus on research about how kids use the Internet and the types of cyberbullying that occur. The discussion will feature how school problems and cyber-issues impact friendships and what to discuss with your child to reduce the risk that he or she will become involved. Bullying and cyberbullying can impact growing teens emotionally, academically, and can result in long-standing problems. Education and awareness is the answer. 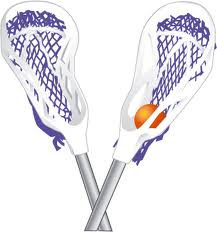 Bridgewater Youth Lacrosse is a non-profit organization dedicated to nurturing the talents of youth lacrosse players in Bridgewater. In our 7th year, we are happy to offer the following programs for the upcoming 2011 Season. This program is part of Massachusetts Bay Youth Lacrosse League. Teams travel throughout the South Shore to play. Coaches have weekly or twice-weekly practices. Games are played on Sundays (TBD- some mid-week games may be possible). This 7-week program will take kids through skill drills and scrimmages to improve their Lacrosse skills in preparation for the Spring Travel season. Great program for entry-level players. The Beginner program is held on Sunday mornings and includes a practice & scrimmage. Kids will learn the basics of the game inc. ball handling, cradling, etc. This fun starter program will prepare new players for participation in the Spring Travel program. The Bridgewater State University Alumni Choir will perform a holiday concert entitled "Stars, Snowflakes and Song." Tickets are $5 for students and seniors and $10 for adults. For tickets or for additional information, please call 508.285.3125. The Friends of the Bridgewater Public Library will sponsor a Holiday Book Sale on Saturday, December 4th from 11AM to 1PM. A "Friends Only" preview will take place from 10-11 AM. Applications to join the Friends will be available. The sale will feature gently used books on many topics, including a large selection of children's books. It will be held in the Flora T. Little Meeting Room on the lower level of the library and parking is available in the back of the library. Bridgewater Brew, the library's own special brand of fair-trade organic coffee will be available for purchase with whole bean, ground, regular, dark roast and decaf all being available. The Friends will also be selling coffee mugs with a reading theme which would serve as an ideal holiday gift! The Children's Department at the Bridgewater Public Library has announced two, holiday-themed story times in December. Toddle storytime, for children ages 2-3 with an adult will be offered on Thursday, December 9th from 9:15 to 9:45 am. This program will include stories, songs and rhymes. Preschool storytime, for children age 4-6 will be offered on Wednesday, December 8th from 1:30-2:00pm. Children must be able to sit without an adult. This program will include stories, songs and rhymes. Registration is required and will begin November 22nd at the library. Drop by the Children's Room to register or call 508-697-3331. No email registrations will be accepted. The Children's Room of the Bridgewater Public Library will offer a holiday program- Exploring Music- on Saturday, December 11th at 10:30 AM. Join music educator Kerry Campbell for singing, rhythm games and creative music activities that will get your child thinking of music in a whole new way. This program is for children age 2-6 accompanied by an adult. Registration is required. To register, drop by the children's room or call 508.697.3331. No email registrations will be accepted. The Holly Day Artisan Faire will take place on Saturday, December 4th at the First Parish Unitarian-Universalist Church located at 50 School Street in Bridgewater. This event will take place from 9AM to 3PM and will feature handcrafted items, 5-minute chair massages, gifts, a cookie walk, holiday cheesecakes, homemade soups and breads and a visit from Santa from 11AM to 1PM. This is a free event for all to enjoy! Bridgewater Art and Custom Framing "Virtual Tour"
Make sure this holiday season you support Bridgewater's local businesses. Here is a virtual tour of Bridgewater Art & Custom Framing which offers great gift ideas for anyone on your list! 1. There is an all night on street parking ban in effect between the hours of 2AM and 5AM from December 1st through April 1st. Vehicles parked on the street or sidewalk will be ticketed by the Police Department. During snow plowing operations, they will be towed at the owner's expense regardless of time of day. 2. 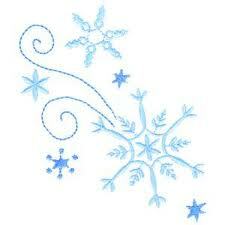 It is illegal to remove snow or ice from private property and place it in the roadway or sidewalk. This can create a hazardous condition where the homeowner may be held liable in the event of an accident caused by this. 3. It is illegal to pump water or other liquids onto any sidewalk, street or public way during the months of November through April. 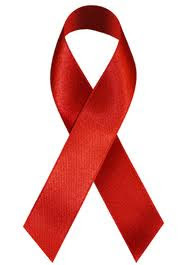 Join students, faculty and community members in an effort to raise awareness for HIV and AIDS. March to the Moakley Center to hear speakers talk about HIV and AIDS. Refreshments will be served. Toddler story time for children age 2-3 with an adult will be offered on Thursday, December 9th from 9:15 to 9:45 AM. This program will include stories, songs and rhymes. Preschool story time for children age 4-6 will be offered on Wednesday, December 8th from 1:30 to 2:00 PM. Children must be able to sit without an adult. This program will include stories, songs and rhymes. Registration is required and to register please either drop by the Children's Room or call 508.697.3331. No email registrations will be accepted. This exciting annual event includes a “Just for Kids” Shop, photos with Santa, a bake sale, lots of raffles, and a vendor / craft fair with over two dozen crafters. The “Just for Kids” Shop offers hundreds of items priced at only $1.25 so children can purchase items for their family and friends. The Lions Clubs in District 33-S are planning our next OPERATION SHOEBOX event. We need names and addresses of soldiers who are stationed outside our country. Please ask friends and neighbors if they know of anyone in the military. We would be honored to send them a package with our next shipment. We also need supplies. If you are able to donate any supplies please consider donating items like AA batteries, Advil, antiobiotic cream, athlete's foot cream or spray, baby wipes, bacon bits, band-aids, bandanas, paperback books, breakfast bars, chap stick, CDs and DVDs, ground coffee, coffee mate, coffee mugs, dental floss, deodorant, duct tape, eye drops, hot sauce, hot chocolate, playing cards, Q-tips, soap, socks, tea bags, toothbrushes and more. For a complete list of information, email the contact information below. I have also been asked by my brother-in-law, TC, who is stationed in Afghanistan if we could please send supplies to the elementary school that is near him. The school has 2,000 students and they are in desperate need of used or new back packs (the size for kids not for teens, if possible), pencils, erasers, notebooks and pens. I will be happy to arrange to pick up your donations but I am looking for a drop off spot to make it easy for everyone. Any school supplies that I receive will be sent to TC for this elementary school. "These children want to learn, the school wants to teach them, they are trying to better themselves and educate themselves, which in turn makes our Counterinsurgency jobs much easier, but they need help. So instead of sending me care packages just send the school supplies. Instead of sponsoring a soldier, sponsor a school for a soldier. If you had seen the school and children yourselves you would feel the same as I do. So specifically…send pencils, 8x11 notebooks or smaller, and backpacks. These children are small so keep in mind not to send large high school size backpacks. I’ll send you pictures of me distributing these items with the Afghan forces and you can see the smiling little faces. I attached a picture of one of the classrooms. It doesn’t really do it too much justice but you will see that it’s small, dirty, no desks, and few supplies." Thank you for any help you can provide. Even if you don't support the war I hope you will support our troops and the people they are trying to help. Sporadic Evolution's production of the Charles Dickens classic, A Christmas Carol, directed by Donald Sheehan, is sure to delight the entire family. Featuring Scrooge, Christmas ghosts and an adorable Tiny Tim, it's a sparkling, music-infused celebration of goodwill that your family will never forget. A Christmas Carol will be presented Friday and Saturday evenings at 7:30PM on December 4th, 10th and 11th at the Eldon T. Cole Parish House located at 15 Cedar Street in Bridgewater. Admission is $15 per person, $10 for children ages 12 and under, senior citizens and students. Please call 508.532.2738 for reservations. Sporadic Evolution will also be hosting a toy, clothing and food drive to benefit local charities. There will be a donation drop off station at the ticket table and any contribution is appreciated. The Board of Selectmen have released their agenda for their meeting Tuesday, November 23rd. The Bridgewater Public Library and Bridgewater State University are pleased to announce the screening of the film Your Are Not an Orphan. It will be held on November 30th at 6:30 PM in the Flora T. Little Meeting Room at the Bridgewater Public Library. The event is free to the public and will be followed by an open discussion. You Are Not an Orphan is an Uzbek film by Shukhrat Abbasov and is for general audiences. It is based on true events about the family of a blacksmith couple in Central Asia who take in fourteen children evacuated during World War II while their own son is away at war. The children are of different ages and nationalities and learn to live together as a family in one home. Every child gets to the Makamov family by accident but stays there by the good will of the foster parents. When the son returns home from the battlefront with another boy from the country of the enemy army that child is welcomed into the family, as well. The event is a collaborative effort between the Bridgewater Public Library and Bridgewater State University with the purposes of strengthening the community relationship between the town and the university as well as raising awareness of cultural diversity. Light refreshments will be available for attendees. The Strength Studio is sponsoring a one month special with membership for $25. The offer is available from November 15th through November 30th and is available for new members only. Get ahead of the holidays and start on your New Year's resolution early. Don't wait a minute longer to take care of yourself. The Strength Studio is designed to provide women with the ultimate group fitness experience. They will help you to achieve your goals through high energy classes and the most qualified instructors. The TJ2 Robotics team will be hosting their annual dinner and auction. Silent auction and Chinese auction items available include: Christmas baskets, graduation tickets, handmade afghans and quilts, autographed sports items, wine baskets, handmade candles, Martha's Vineyard vacation home for one week, Microsoft software, Patriots tickets, Bruins tickets, Celtics tickets, fire truck ride, police ride-along, Trinity Rep tickets, sports equipment, gift certificates and more! BR staff: If you can't come to the auction, come by room H105 on Wednesday, December 1st to buy raffle tickets for the Chinese auction or talk to Carla Souza to set up a TJ student to put in your bid for a silent auction item. Raffle tickets are 10 for $10. Tickets to the dinner/auction are $25 per person and checks can be made payable to BRRSD, with bank checks required for amounts over $100. For more information about tickets, please contact Anne Hall at anniem81949@yahoo.com. Cost: Prices vary. Examples, computer system $15, TVs $15-$18, printer $10, VCR or DVD player $3, air conditioner $10. For a complete price list, visit www.bridgewaterlions.org. Examples of items being accepted: computer monitors, laptops, CPUs, speakers, keyboards, wires, televisions, copy/fax/printers, phones, DVD players, VCRs, iPods, microwaves, air conditioners, refrigerators, stoves. On 28 December 1941, Rear Admiral Ben Moreell requested authority from the Bureau of Navigation to create a contingent of construction units able to build everything from airfields to roads under battlefield conditions. These units would be known as the "Seabees"-for the first letters of Construction Battalion. The men chosen for the battalions were not ordinary inductees or volunteers; they all had construction-work backgrounds. The first batch of recruits who made the cut had helped build the Boulder Dam, national highways, and urban skyscrapers; had dug subway tunnels; and had worked in mines and quarries. Some had experience building ocean liners and aircraft carriers. Approximately 325,000 men, from 60 different trades, ages 18 to 60, would go on to serve with the Seabees by the end of the war. The officers given the authority to command these men were also an elite crew, derived from the Civil Engineer Corps. Of the more than 11,000 officers in the Corps all together, almost 8,000 would serve with the construction units. Some of the Seabees' feats became legendary. They constructed huge airfields and support facilities for the B29 “Superfortress” bombers on Guam, Saipan, and Tinian, as well as the ports needed to bring in the supplies for the bombing of Japan. The Seabees also suffered significant casualties in the process of providing innovative new pontoons to help the Allies land on the beaches of Sicily. During D-Day, the Seabees' demolition unit was among the first ashore. Their mission: to destroy the steel and concrete barriers the Germans had constructed as obstacles to invasion. 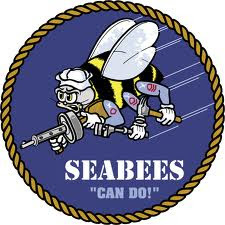 The Seabees' motto is "We Build, We Fight." Merry Christmas and Happy Hanukkah!…..remember our fellow Americans serving throughout the world in “harm’s way.”… God Bless Our Troops!! God bless those that gave their lives and those that have served to ensure our freedom since 1776.. The Bridgewater Community Preservation Committee unveiled a sign designating the Town Hall preservation work as supported by the Community Preservation Act. Community Preservation Chair Marilee Kenney Hunt addressed a small group of people on Thursday afternoon as she and Bob wood, another member of the Community Preservation Committee, and members of the newly elected Town Council unveiled the sign while Town Manager Troy Clarkson, Fire Chief George Rogers and a number of other citizens looked on. The sign, designed and manufactured by Bridgewater Trophy, will be used at this and all future sites of Bridgewater's CPA-funded projects. The Town Hall preservation project is overseen by the Bridgewater Municipal Building Committee chaired by Planning Board member John Gerrish and staffed by Sharon Travers Gay of STG Consulting. The architectural design work is done by Gienapp Architect Associates, LLC and the contractor is MCM USA, LLC. Newly elected Town Council members who attended were Peter Colombotos, Kristy Colon, Timothy Fitzgibbons and William Wood. Ms. Hunt's remarks praised the forethought of Bridgewater voters who in 2005 adopted the Community Preservation Act. Several other CPA projects are underway in Bridgewater and last spring the new Girls Softball fields that also received substantial CPA funds were dedicated. 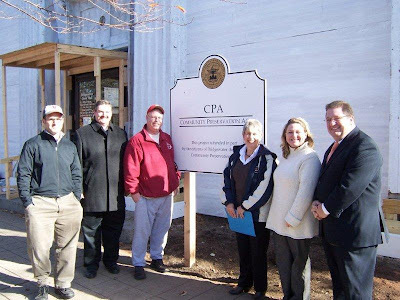 For more information on the CPA, go to www.bridgewatercommunitypreservation.org. National Native American Heritage Month Powwow to be held in the Kelly Gym at Bridgewater State University on Sunday, November 14th from 11AM to 6PM. 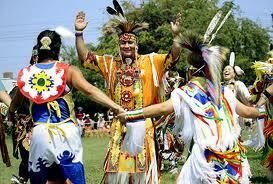 Enjoy inter-tribal dancing, dance demonstrations, pottery demonstrations, social dances and storytelling. Arts, crafts and supplies for sale in addition to traditional Native foods. Governor Patrick issued a proclamation declaring November 2010 to be Family Literacy Month. Family Literacy Month is an opportunity to support children of all ages in out-of-school learning, engage parents in supporting their children's education, and engage community partners in supporting and celebrating lifelong learning and family well-being. To promote family literacy, the Children's Room at the Bridgewater Public Library is celebrating with two family storytimes. The first is scheduled for Monday, November 15th at 6:30 PM and will be repeated on Saturday, November 20th at 11:00 AM. No registration is required and each program will last approximately 30 minutes. All ages are welcome. Did you know that there is an online auction taking place right now to help raise funds for The Bridge Center? There are some great items being auctioned off and with proceeds going to such a great organization this is a win-win. Click here to access the online auction page. I was deeply disappointed by the lack of facts in "Will anyone miss powerless official from Bridgewater"? The incorrect interpretation of the open-ended transition period supports further spending WITHOUT fiscal restraint. Fiscal reforms have not been analyzed or even discussed by the Board of Selectmen, Town Meeting, and or the council elect. It was never suggested that the money allocated to the police and fire be put in the general fund. However, the money may be needed to prevent lay-offs in the police and fire if the state has mid year cuts or state aid to cities is reduced for FY12. When the town has 39 firefighters to 25 police officers the question must be asked: In an environment of limited funding does it make sense to hire equally across the board without collectively discussing and ranking competing public safety priorities? The charter in which I supported is crystal clear that the ELECTED council is entrusted with the fiduciary responsibility for the town and therefore must provide review and oversight of the budget. Simply put; the Board of Selectmen and/or council CREATE policy and the town manager has full line authority to ADMINISTER such policy. As such, the town manager and department heads are charged with deciding whom to hire but NOT whether to hire because that’s a POLICY decision. Despite having identified potential funding shortfalls due to unexpected retirements and other circumstances since the override passed, the Board of Selectmen has never discussed the number of hirings, and most troubling, never voted to approve such hiring. To simply hire first and present the case after Town Meeting and before Town Council is seated undermines the founding principles of self-government. Lastly, the override did not address the structural imbalance. Expenditures continue to outpace revenues. Further reform as promised to get costs in line with revenues have not happened. Therefore, the Enterprise is incorrect to think many residents feel the town should just "spend all the money", otherwise, "the feeling would be their money is wasted and that local officials don't listen to them." After a second successful run in October for elected office to represent District 3 in Bridgewater, I can assure you I have listened to many in town and the resounding message is to spend override funds cautiously and wisely. The Bridgewater Public Library is raffling off 2 sets of tickets for the Exhibit Halls at the Museum of Science in Boston. The two lucky winners will each receive two tickets, which can be used at the museum through the end of December 2010. This is a free raffle with one entry per person. The drawing will be held on November 17th. On Wednesday, November 10th, the Taunton branch of the AAUW (American Association of University Women will meet at the Arbors in Taunton located at 763 County Street. The meeting which is open to the public begins at 6:00 PM. A silent auction for the AAUW Legal Advocacy Fund and Education Foundation will take place after a bread and soup dinner. The greater Taunton branch is open to women from Bridgewater. For more information about the local area branch of the AAUW call Karen Messing at 508-378-330. Click here for more information on the AAUW. The Bridgewater Public Library will offer a program on Preventing Scams and Fraud- at home, at work, and on the Internet on Tuesday, November 9th at 6:30 PM. There is no shortage of scams out there today. Scam artists are always adding new twists and finding more victims. The saying that, "If it sounds too good to be true, it probably is" applies more today than ever. The best way to protect yourself is knowledge- know the danger signs and exercise caution at all times. A representative from the Better Business Bureau will give you tips on how to improve your consumer skills and alert you to some of the most common scams. The Better Business Bureau is a non-profit public service organization that provides free business BBB Reliability Reports, BBB Charity Reports and other valuable information to the public. This free program will be held in the library's Flora T. Little Room on the lower level. Parking is located in the back of the library. Cranberry Harvest Fair at the Central Square Congregational Church located at 71 Central Square in Bridgewater. Homemade pies, cookies, candies, silent auction, gift baskets, crafts, holiday decorations and attic treasures! Proceeds will benefit local and global charities. The Highway Department requests that residents do not rake leaves from their private property into the roadway. The Highway Department will pick up leaves that fall on the roadside only. They will not pick up leaves that have been raked from private property to the roadside. Leaves that are raked onto the roadway can clog the street drainage catch basins and cause flooding problems. This creates an extremely dangerous condition for which residents may be held liable. The Board of Health provides a free year-round leaf drop-off area for residents at the Transfer Station on Bedford Street, provided that you have a current vehicle sticker issued from the Board of Health.